I’m really squeaking this in and I hope I’ll be able to link it up.. tomorrow is Class Three of Jenny and Aaron of Everyday is a Holiday Art Journaling Classes, and I just finished Class Two. Eek! I’ll give you the short version.. 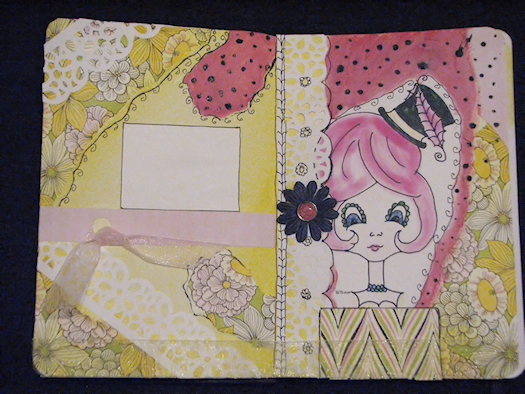 I started with a floral Anna Griffin paper and my newest free Crudoodle digital stamp, Clara. Some ripping and coloring and gluing happened. 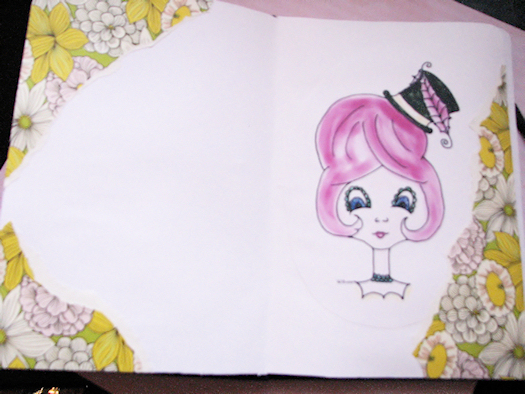 I added some paint in yellow and pink, more paper, some doodling and some paint dots. I punched out some lacy borders, added sheer ribbon with a nice metallic sheen and a flower and pink brad. I left a little square to add some text later. I don’t know what I want to write there. I’m sure I’ll think of something. I’m loving the classes with Jenny and Aaron. Check them out and see what everyone else is making… maybe join in. You’ll love it! Posted in Uncategorized and tagged altered art, art, art journal. So loving the color scheme, and the layers and textures you're using! The doodling ties everything together so well. And thanks for sharing an in-progress photo. Love to see the way a spread starts and finishes. Look forward to seeing you in the coming weeks!